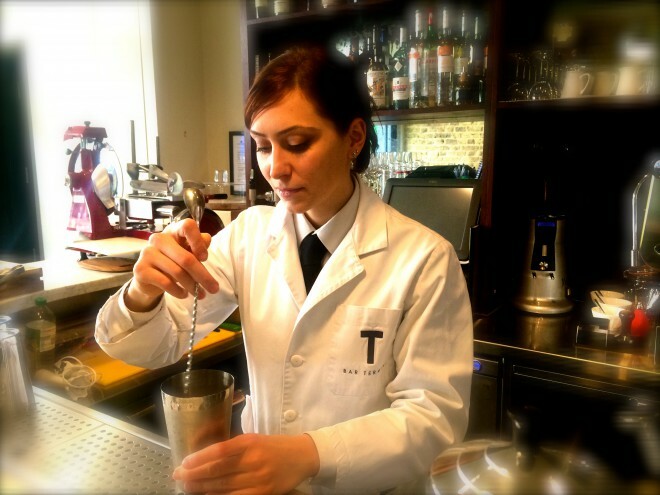 Hi, I’m Roberta Mariani and I’m a bartender at Bar Termini in London. I ‘am from Italy, this is where I first went for drinks, watching the bartenders mix them was like chemistry and I fell in love with the magic of bars. I was studying at the time and would work in a bar during the weekends, this is when I knew it was what I really wanted to do, so I finished my graduation and continued to work in bars. I moved to London 3 years ago because for me it was the place to be, I feel like London is my city. Of course I had to improve my English before bartending here, and now Tony Conigliaro has given me the opportunity to progress and work in his Drink Factory Ltd. where we develop the creative approach that I love in this job. The bar of my dreams would be like where I work now, Bar Termini. An Italian style from the 40’s or 50’s with a nostalgic feeling of the dolce vita in Rome. It would have a touch of elegant romanticism with class, minimalist style. I really like Japanese bars, so small and precise which creates intimacy like here, a place where you can’t seat more than 30 people. It’s cosy and you have the time to discuss with your guests. Not a large cocktail list either, so it keeps the attention of your guests and you can take the time to explain the cocktails in depth. Of course you could also order classics that would be tailored for the individual. I would have a food element as well, because food is part of the cocktail experience, it’s complementary. And, of course because I love Japanese whisky, I would have a lot in my bar. When I go out it depends on the day or my mood, but there are 3 bars I really like in London. The Artesian, where I have friends working behind the bar, so I have good drinks, nice conversations and lots of fun. Otherwise I really like a mezcal/tequilla barnamed El Nivel in Covent Garden and they serve great tapas too. Because I love Japanese whisky my last choice of bar is Red Bar, I really love this place as it’s cosy and intimate. I love whisky to drink, but to work with, I prefer gin. I used to hate it when I was young, but I discovered how it’s easy to use. All the botanical are really easy to mix. Instead of vodka I prefer to use gin as it adds a kick that other spirits don’t have. Obviously a good cocktail should be drinkable. It’s very subjective as it depends on your guest’s taste and if they prefer strong or refreshing drinks. You have to be able to match with the guests preferences and tastes. This my job and the trick is to see if they carry on sipping it and enjoying the flavours, then I know it’s a good one. You can see if they can’t stop, they want more and they order another one, then you’ve got it. I think sugar is the one, like simple syrup. Don’t get me wrong, I love dry cocktails but a tiny amount of sugar can amplify and carry on the other flavours and ingredients when everything is blended together. Another simple thing is lemon. You can have something flat and with a twist of lemon, it changes it. When you work with Tony Conigliaro you learn to enjoy simplicity. A good person to meet is Will at 69 Colebrook Row, he has a massive knowledge and the way he interacts with the guests there is brilliant. And as an experience, most of the bars in Japan like Thank bar in Kumamoto, K6 in Kyoto and Mod Walk in Tokyo.